Thomas Brassey – the railway magnate – purchased Heythrop Park as a wedding present for his son, Alfred, in 1869. He then commissioned Alfred Waterhouse, the Quaker architect who was also responsible for the design of the Natural History Museum, Strangeways Prison and Pierremont Park in Darlington, Co Durham– see Site of the Month #10, Mar12, at http://pulham.org.uk/2012/03/01/10-march-2012-pierremont-park-darlington – to restore the house. This is also likely to have been the period during which he commissioned James 2 to ‘beautify’ part of his gardens. No records exist that will definitely establish the exact date on which this work was constructed, although there are a couple of rather intriguing clues. 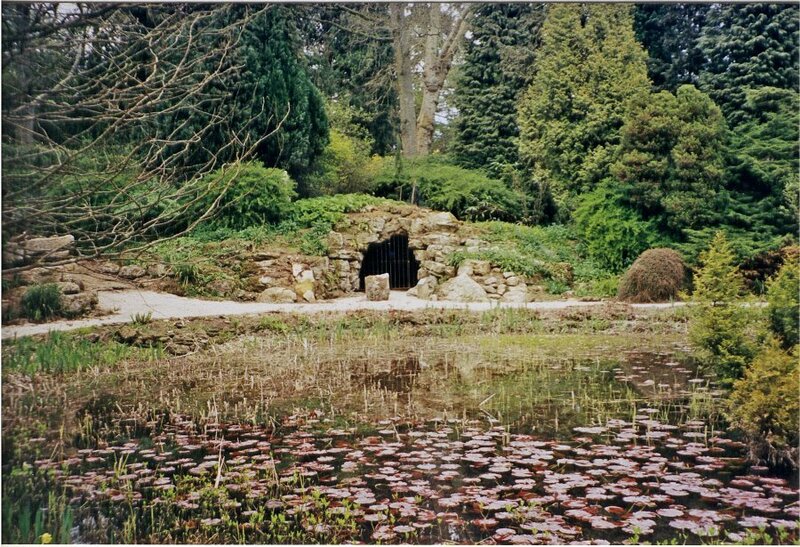 James 2’s pre-1877 client list includes an entry for Preston Hall, in Aylesford, Kent, where they constructed a waterfall, stream and fernery in 1875. The patron was H A Brassey Esq, MP, so could this have been Albert’s brother or cousin? Or was it perhaps via Albert’s architect, Alfred Waterhouse, who would have met James 2 during his work at Pierremont Park for Henry Pease – also in 1875? However it was, the work at Heythrop Park must have been later than 1877 – but probably not much later – so the suggested date is around 1880. The Brassey family continued to live at Heythrop Hall until 1920, when the house and estate were split into lots, and finally sold. The house and 440 acres of land were purchased by the Provincial of the English Jesuits, who stayed there for more than forty years, during which time they made a number of very significant additions – the Shrewsbury and Archer wings were added in 1924, and the halls of residence and air-conditioned library between 1965 and 1968. The Provincial of the English Jesuits eventually moved to London in 1969, and sold Heythrop Park to National Westminster Bank, who developed the house into a state-of-the-art conference centre, and then they, in turn, sold it in April 2000 to its present owner, Mr Firoz Kassam, who continues to use it as a conference centre, and has also added the facilities of a 5-star hotel and golf and country club. Tucked away in a remote part of the estate, in a small clearing in the woods, is a circular pond that, at first sight, doesn’t strike one as being a typical Pulham feature. 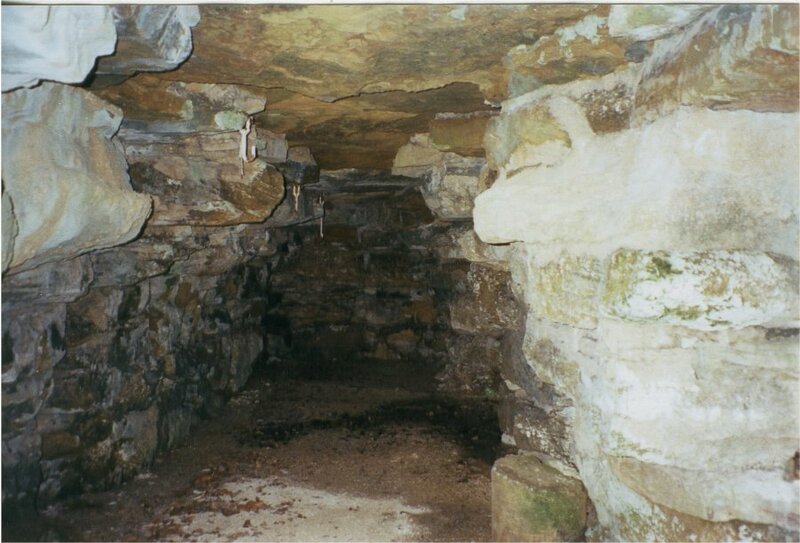 This impression soon changes when one looks around, however, because, as can be seen in Fig 1, there is some rockwork on the opposite side, with a large grotto in the centre. This is shown in close-up in Fig 2, and, for some reason, there are two entrances – one to the front, and the other near the back right. It is apparently very popular with the local bat population, who, according to my guide, probably use the front as an entrance, and the back as an exit. There is a more plausible explanation, however. 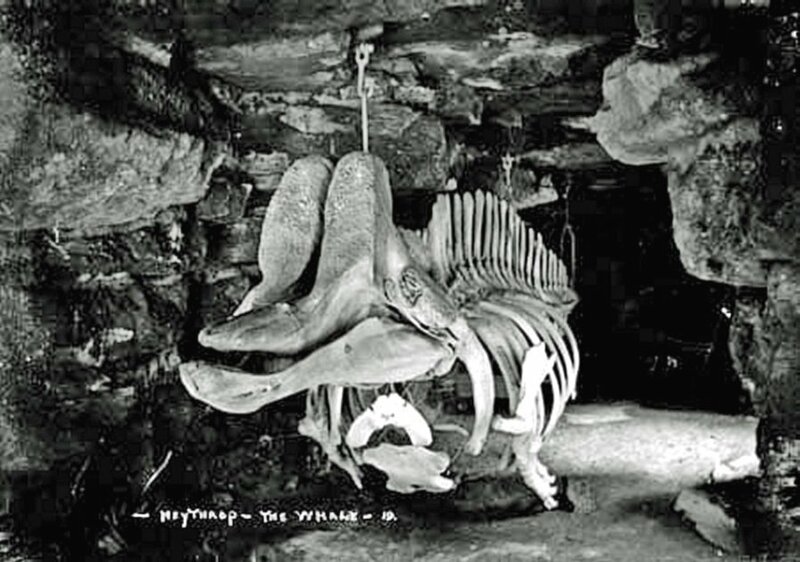 This used to be known as the ‘Whale Cave,’ because it was originally built to house part of the skeleton of a whale – a memento of one of Thomas Brassey’s many travels, so perhaps the idea of having two entrances was to enable the visitor to view the contents from two different angles? In fact, the hooks from which the skeleton was hung can still be seen in the roof in Fig 2, while Fig 3 is from an old photograph that actually shows the skeleton in place. This is not the entire extent of Pulham’s work, however, because, as can be seen from Fig 1, the Pulhamite rockwork extends slightly to either side of the cave. 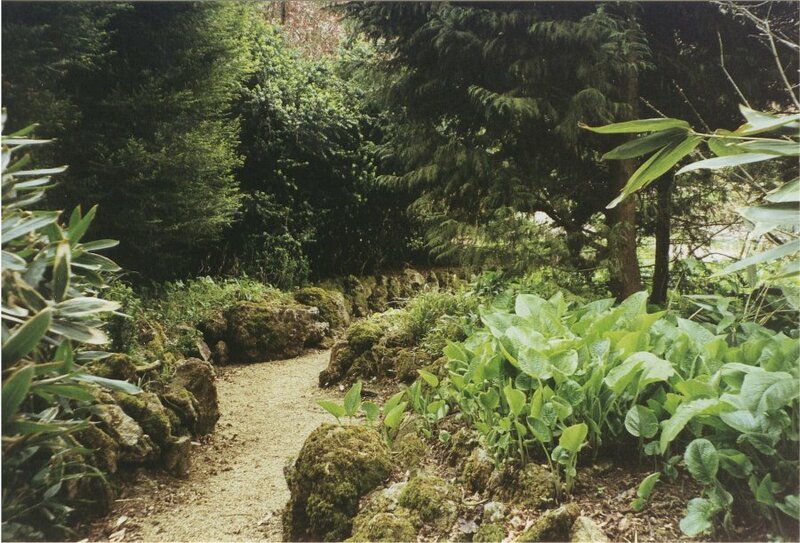 Fig 4 is a view of one of the lovely, peaceful, rock-lined pathways that lead off the clearing. 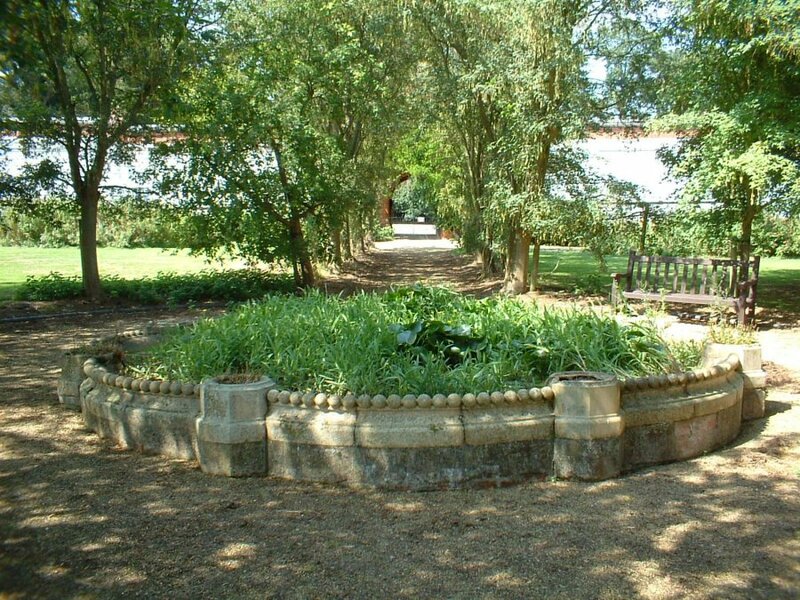 There is also the base of a fountain in the Walled Garden (Fig 5) that has long since ceased to function as a fountain, but nevertheless bears all the hallmarks of a Pulham piece. Posted on September 1, 2014 June 4, 2016 by Claude HitchingPosted in Sites Month 2Tagged 'Whale Cave', . . James Pulham and Son, Alfred Waterhouse, Boat Cave, Firoz Kassam, Heythrop Park, Thomas Brassey.